Significant cost and parts reduction, plus supply chain efficiency, can be realized through Vibratech TVD’s integrated design capabilities to engineer and precision CNC components into the outer housing of a viscous damper. Vibratech TVD solicited by global OEM engine and vehicle manufacturer to participate in exercise to reduce weight, cost and improve longevity of current torsional damper. 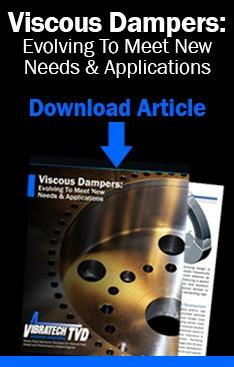 Fluidampr performance dampers, a product of Vibratech TVD, often requires pulleys machined into the outer housing. In addition, mounting bolt patterns are pre-drilled to accept a wide variety of accessory drive pulleys or mandrels for running dry-sump oil systems. Some popular Fluidampr performance dampers even incorporate a tone-ring for electronic ignition pick-up. Mounting flange integrated on outside of housing. Timing gear and drive pulley integrated into outer housing. Crankshaft counterweight machined into outer housing. Crankshaft damper with A/C pulley machined into outer housing and removable drive pulley bolted on. Adaptable mandrel bolt pattern integrated into outer housing with material machined around it to reduce weight. Material machined from hub area to reduce weight but keep design strength. Dual wide v-belt pulleys machined into outer housing.